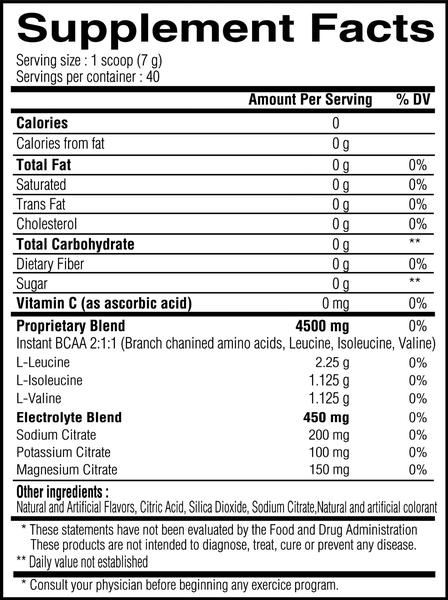 Enter your email address and choose your notifications for Yummy Sports Candies BCAA - Cherry Blast! Yummy Sports, an awesome young Canadian brand is a great fit here at the Mix! The fun, candy flavoured BCAAs, now with added electrolytes, sound great, look great and TASTE great!! As well as of course being the perfect supplement to hydrate you and fuel muscles whilst you're training these cheeky little Cherry Blast, sweetie flavoured BCAAs are awesome to sip throughout the day, whether at your desk or on the go!! A 100% instantized blend, in the usual 2:1:1 ratio shaking up with only a hint of colour these super smooth amino's are here to 'catapult your athletic performance to the next level' as the guys at Yummy Sports pitch right on the side of the tub!! Amino acids are here to increase nutrient availability meaning your body can absorb nutrients better and send them RIGHT to your muscles for maximal effects during your workout!! Containing essentially 0 calories with absolutely NO sugar involved. These BCAA's REALLY do a good job of reminding us of sweets!! Flavour here folks is 100% on POINT!! Quality, purity and most importantly incredible taste!! Coming in a BUNCH of sweetie flavours too folks....pick ya favourite candy flavour and give 'em a whirl guys!! Why Yummy Sports Candies BCAA - Cherry Blast Flavour? !